Meet the 2018 Totus Tuus Teams! We have TWO teams this year, and they are worth meeting! They are the mighty...2018 Superior Totus Tuus Teams!!! St. Pio de Pietrelcina, pray for us! Haley Arndt is a joyful second-year Totus Tuus missionary from Merrill, Wisconsin. Going into her senior year at UW-Steven’s Point, Haley is studying Psychology with a minor in Communications and Religious Studies. She spent the past year and a half tending to the needs of other college students as a Resident Assistant at UWTP, stating that she enjoyed witnessing the growth of her students throughout the year. Haley felt God’s tug on her heart to serve for a second summer as He reminded her how much she really loved her 2017 experience, especially the amazing children, parishioners, and teammates she worked with. If given the chance to meet Haley, I guarantee you’ll enjoy her fun-loving, joyful personality and her passion for sharing Christ with everyone. ​3) Became Catholic last Easter! CJ Kallevig grew up in Kandiyohi, Minnesota and recently graduated from Winona State University with a degree in English Language and Literature. Newly Catholic as of Easter 2017, CJ has embraced her new identity by serving her campus through leading a bible study and welcoming everyone into the Newman Center community with open arms. She has felt called to mission since childhood, specifically through living in Africa for one year with her missionary parents and nine other siblings. CJ was lead to Totus Tuus through searching for opportunities of mission post-graduation. Her unique joy as a convert to the Catholic faith is inspiring to all who encounter her. Emily Kling was born and raised in the Catholic School program in New Richmond, Wisconsin. Currently studying Theology (and minoring in Psychology) at College of St. Benedict, she enjoys learning about how the Lord works in the lives of His people. She chose to serve as a Totus Tuus missionary this summer because of her deep belief in the importance of solid Catechesis. She desires to bring fun, fruitful, and loving knowledge of Christ to the youth and hopes to help their formation from a young age. Robbie Simon comes to our diocese all the way from Redando Beach, California and is prepared for his “summer of self-gift.” He is a student at Franciscan University of Steubenville, studying Theology and Philosophy. His passion for practicing and loving his Catholic faith through prayer and the sacraments is extremely apparent, something he wouldn’t be able to live without. Robbie desires to provide the youth with a quality Catholic formation and catechesis since he did not have great opportunities to do so growing up; he hopes that the children can grasp what a gift our faith is in order to understand their identities in Christ. Charles Luke is going into his senior year at Franciscan University of Steubenville, studying Philosophy and Theology. 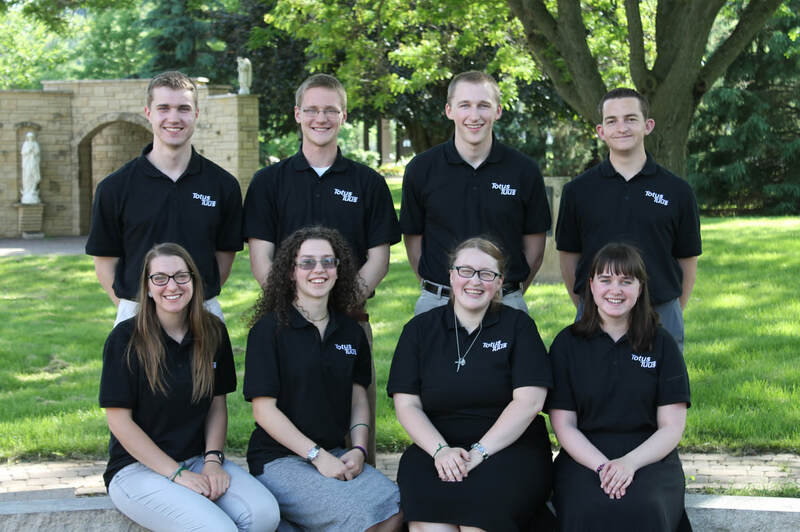 Originally from Kohler, Wisconsin, he is serving in our diocese for his second summer in a row. His favorite part of last summer as a Totus Tuus missionary was spending time at each parish and witnessing their incredible differences. Charles has chosen to return because his experience last summer was incredibly formative, not to mention a ton of fun. We’re blessed to have Charles back, especially after a transforming semester abroad in Austria. Dan represents our diocese well by growing up within our own Cathedral of Christ the King in Superior, Wisconsin. Before his current studies of theology at St. Francis de Sales Seminary, he attended undergraduate school at Iowa State University, graduated with a master’s degree from Ball State University, then served as a FOCUS missionary (the Fellowship of Catholic University Students) for a few years before discerning the priesthood. Dan’s burning passion for evangelization is evident throughout his life, and he is looking forward to knowing and loving the beloved people of our diocese as an alumni. He also strives to share the common experience of value and friendship that the young priests have had throughout the years serving as Totus Tuus missionaries. Maysel Giebel comes to us from Hudson, Wisconsin, in a devoted Catholic family of 10 other siblings. She just completed her first year at St. Thomas University, studying Psychology and Catholic Studies with a minor in Philosophy. Her passion for reading is clearly expressed by her deep wisdom and knowledge of our faith, literature, and many other topics—ask her about the Count Monte Cristo sometime! Having attended and volunteered for the Totus Tuus program in the past, Maysel desired to be a part of the mission team and was encouraged by her youth ministers to share her wisdom and talents with other children similar to her younger siblings. Brandan Kalsow is a Computer Science major with an Econ minor at St. John’s University. Growing up in Hudson, Wisconsin, he has volunteered multiple years for their Totus Tuus program, eventually feeling drawn to dedicate his summer to serve with other parishes in the diocese. He was also influenced by a few priests and parishioners to say “yes” to the adventure when they saw his love and interest in the Liturgy of the Hours. Are you interested in joining next year's team or do you know someone who would be a great Totus Tuus teacher? Check out the 'Join Next Year's Team!' page!